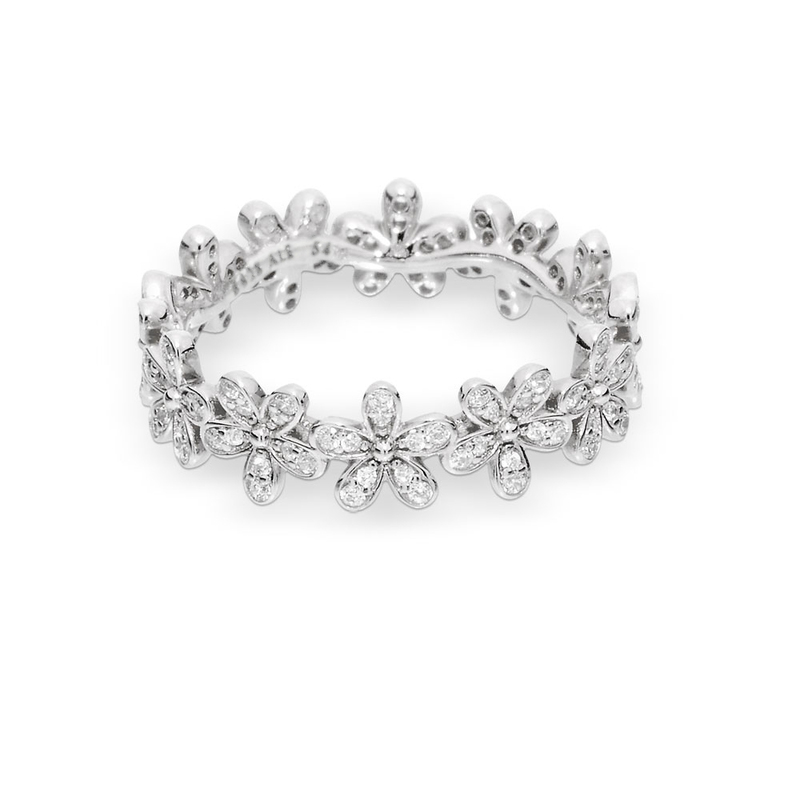 The Dazzling Daisy Chain Silver Ring Band is made up of delicate flowers, embellished with cubic zirconia stones, linked to resemble a daisy chain. Buy rings online or in store. Dazzling Daisy Chain Ring - PANDORA is rated 4.3 out of 5 by 66. Rated 3 out of 5 by nana24 from Have had trouble losing stones in this ring. I really love this ring, it's very delicate and dainty but I have had to have it replaced a couple of times because of the cz's falling out. Rated 3 out of 5 by Dh0312 from Super cute but not practical The right was adorable but because the petals on the flowers didnt lay flat (some were raised higher than the ones next to it) they got stuck of everything. The flowers were also rough feeling and pulled threads on every fabric it touched. I returned the ring within 2 days because it was getting caught on everything and ruining my clothes. Rated 2 out of 5 by Samy from cz's falling out I got this product couple months ago and the stones kept on falling out i got it replaced once and it did the same within 4 days. Rated 1 out of 5 by Collin77 from Diamond fell out I bought this ring less than a month ago and one of the diamonds already fell off. It was barely worn and is now already broken. Rated 5 out of 5 by FlowerChild18 from Dainty and Cute! I just received this in the mail today and I'm already obsessed. Its dainty and light. Rated 5 out of 5 by Samantha123 from Love it! I bought this about a month ago and I have received so many compliments. It's honestly such a beautiful ring and very unique as well. Definitely recommend getting if you want something different. Rated 4 out of 5 by Omgpop_21 from There’s one thing I absolutely love this ring. I wear it all the time. However, it snags on all my clothes when I’m getting dressed. That might be a deal breaker for some.